Edited by EnergyZ at 20:19, 16 Dec 2016. 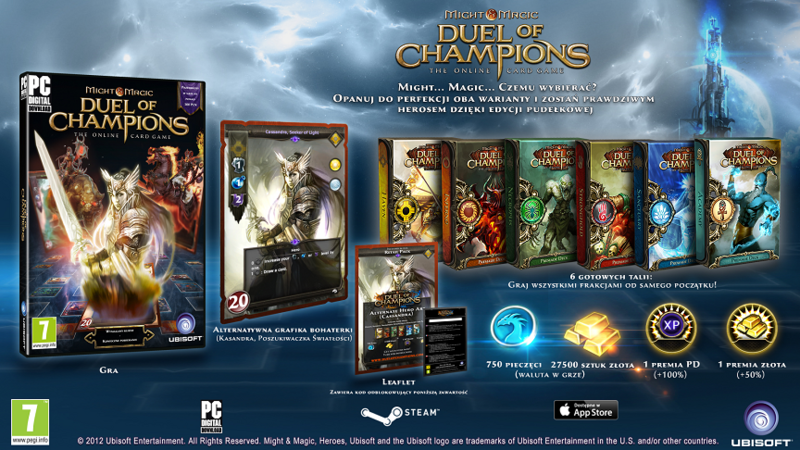 Does anyone know about any other Duel of Champions sites? I'm trying to find some info, aside from "duelofchampions.gamepedia.com". I also know of "www.mmdoctools.com", too. Edited by The_Polyglot at 23:34, 16 Dec 2016. Edited by EnergyZ at 22:40, 19 Dec 2016. I was thinking more about other things. One of the things are the descriptions. Apparently, the latest set doesn't have descriptions of the abilities. Are there any descriptions about? Do note that text does have a reference, but that site is banished. Instead, it links to this, which is basically an indirect way of saying "screw you". Hmm, I doubt the lore is preserved, sorry. What new abilities did SoB introduce? I don't recall any. posted December 20, 2016 05:59 PM bonus applied by Corribus on 17 Aug 2017. Edited by Avonu at 18:06, 20 Dec 2016. We've suspected for a while now that Dhamiria, an extremely talented Elemental Sorceress has been collaborating with a band of Renegade Wizards in an effort to summon Demons, but it turns out those suspicions were far off the mark. Dhamiria is a Succubus. Several outcast Wizards of the Seven Cities, accused of being Warlocks, were looking for an undisturbed location to conduct their magical research, and this group was somehow lured to a crumbled Mansion by the enticing Dhamiria, who was remodeling the large estate inherited from her prestigious family. She promised to share her counsel and protect them from outside forces whilst they studied the forces of Chaos. It's possible that she revealed her true identity to them to prove her undeniable superiority in the Chaotic arts. Though she kept her end of the bargain, but the price was high. Some thought it was too high and tried to flee, but the Demon made it clear it wasn't an option. Our spies reported that through months of experimentation the Wizards were becoming increasingly frustrated at their efforts to please their new mistress. Dhamiria was never satisfied and systematically belittled them as incompetent, incapable of mastering the subtleties of Chaos, as she herself summoned Demons effortlessly. One of the Wizards reportedly went insane with frustration as she destroyed his daily creations systematically every evening before supper. We tracked Dhamiria back to her quarters and overheard her muttering to herself about a mind's breaking point. Then it all made sense. The Wizards themselves were the experiment. All this time, Dhamiria had been conducting her own twisted research upon the hapless mages, pushing them to the brink of madness for her own study. We initially feared an alliance between Dhamiria and a forbidden school of outcast Demon Summoners, but it seems quite unlikely that this is truly the case. She is using them for some more dire purpose. The Empire should be careful not to cross paths with the beautiful Succubus... she is far too clever for anyone&#8217;s good. A small flame danced around Alia's fingers, as she reached for a nearby torch. She gently commanded the flame to light the room. She was standing over a wounded soldier. The Castle's halls were filled with those lately. "Time to change your bandages." She said with a motherly voice. Surprised, the soldier moaned in pain but gladly sat up. Angels were usually using spells to heal wounds. But Alia was different; she cared about the contact with her people. It's as if she wanted them to share their pain with her. As she started to clean the poor man's wounds, a proud Griffin Lieutenant marched towards Alia. Her mood went from sweet to sour in an instant. With a single glare she commanded him to stand down and get out of these halls. She turned to the wounded soldier and helped him get comfortable in his bed. "You&#8217;ll be fine brave one..." she said with a smile. Just as soon, fire in the eyes, she turned towards the Lieutenant and walked him outside. "I have received words that your troops engaged in battle and were defeated by a group of Blackskull Clan Orcs. Your orders were to investigate strange occurrences and NOT to attack the Orc's territory." She said sternly. "There&#8217;s no excuse for this kind of mistake. They are still valuable allies, and to my knowledge, there is no proof that they are our antagonists. We are on the brink of a war we may not understand, and now is not the time" pointing towards the hall "to lose more valuable men." "The orders stand. Investigate the incidents in the mountains, leave the Orcs alone, and report back to me. I will not tolerate additional casualties caused by your recklessness." She said with her voice tinged with sadness. "I will regroup with you as soon as I can." "Bad news again... We&#8217;re already stretched thin and now this Dhamiria may require more attention than we envisaged." said Noboru. His spies sat coiled before him, awaiting their master's leave. Noboru mumbled to himself, running his fingers across a Tyrago board, sliding chariots and soldiers from both sides. Without even looking he was replicating one of the most complex strategies known in the Empire. He knew them all by heart. "You", pointing to one of the spies, "Go back to Dhamiria's mansion and await further orders. The rest of you will ride with me to the Griffin Duchy. The heroes of Ashan are in movement." As the spies prepared to move out, wind caught the flaps of Noboru's tent and lifted them enough to reveal the sun rising. The spy master stopped moving, watching the light of the sun slowly gaining ground on the night's darkness. Although he respects his roots and Shalassa's teachings, Noboru firmly believes that true balance lies in the complete control of polar opposites. He set out to master Light's truth and Dark's mystery to become the most accomplished spy on Asha. Each sunset and sunrise reminded him that balance is always possible, barely out of reach over the horizon. This time, Noboru saw it as a sign that events were now in motion. He ordered his spies to move out and picked up his staff. He glared at his board for a while and then back at the horizon. I am not the religious sort, and rather than following the Spider Queen, I prefer simply following in the footsteps of brilliant minds&#8230; Archon Belketh was right. The protection of the Seven Cities can be attained through Necromancy if we are diligent. My troops are Undead but shall one day be able to withstand and wield fire. There are directions to avoid&#8230; and Chaos is one of them. Dhamiria's penchant for destruction made this clear to me. We shouldn't be mad at her for those setbacks, we should be mad at our own incompetence! How can we hope to prove our worth if a single Demon can undo weeks of work. I found a wounded Orc, lost in the woods the other day. Kept him for myself. I killed him of course... But then I raised him from the dead and used him as target practice. Never had the chance to really throw a fireball at someone before. I must have raised him from the dead a hundred times since then... The accursed mongrel is suffering, but he should be glad his wretched life has served a higher purpose. This is what we should spend our time doing; being exceptionally efficient with our craft. It requires us to understand as much about what destroys us as what makes us Undead. Everything must die more than once." Gazal was born in the deserts of the Sahaar to a noble Wizard family of Shahibdiya, while they were travelling through the vast dunes to lay claim to a newly discovered Dragon Vein Nexus. The family discovered the Nexus the following day and multiplied by one hundred fold their already considerable wealth. Gazal, named after a wandering gazelle that lead them to the Nexus, was proclaimed the fortune bringer of their clan. In recognition, they did everything they could to spoil her rotten, but were only partially successful. Gazal could light a fire with a flick of her wrist at the age of seven, and at the age of nine she invoked an ice-storm that covered an oasis she had discovered in the Sahaar desert, and lasted for a day in spite of the scalding heat. Though the exploit nearly killed the little Gazal, it proved that she was destined for greater things. She left the deserts and returned to the Seven Cities to study magic. Gazal's tremendous self-confidence served her well as she became one of the most accomplished and powerful Wizards of the Seven Cities. Named head of House Anima at the tender age of thirty-five, she was voted onto the Council of Nine on her first nomination. She has never even considered resigning from her lifetime position, though many do after the first seven-year term to follow magical studies or personal pursuits. Gazal has only ever had one ambition: restore to House Anima its rightful title as first House, and recover its status as the most powerful school of magic in the Seven Cities and all of Ashan. Gazal argues relentlessly that the only reliable weapon is the Wizard's staff, and that if the Wizards become nothing more than generals and fat merchants, the Seven Cities will one day fall into decay. "A well-trained Wizard is a match for any army, provided the Council of Nine doesn&#8217;t make you fight with your staff tied to your back." Akane was born on one of the major islands of the Lotus Empire and lived the first decades of her life below and above the waves looking for her brother who had no sense of direction. It was after one of her escapades that she was found by her family, her brother gone, and with no memory of what had happened during the last week of her life. Driven to discover what had happened to herself and her missing brother, she sought the help of Naga Water Seers to look into her mind and uncover her elusive memories, alas, to no avail. She was given leave by her Daimyo to embark on a journey to discover the whereabouts of her lost brother. Travelling first to the underground cities of the Dark Elves, she was helped by the Faceless to recover a good part of her memories, glimpses of Merfolk and a Dark Wizard, her brother screaming as he was dragged away. They also explained to her that some sort of Void artifact had been used to erase parts of her memory permanently. It was powerful magic, forbidden even amongst the Faceless. They suggested a magic that might help her, but that could only be learned in the Seven Cities. With the power of Air, it is possible to recall certain events that are forgotten by our own minds but remembered by the Winds. The Sheriffs of the Seven Cities use it often, especially when various witnesses have different versions of the same story. Akane left the Dark Elves to travel to the Seven Cities, and was received after a long journey and longer wait by the Sheriff Asalah, who was moved by her plight. She led her to the Wind Whisperers, Wizards of Air from House Anima, but even they were unable to elucidate her mystery. However, Akane&#8217;s story reached the ears of the ruler of House Anima, High Wizard Gazal, who decided to take the young Naga under her wing. Gazal offered Akane to lead her training in the magical arts of memory calling, where her natural affinities for Water mixed with a reinforced education in Air might indeed prove a valuable mix. Akane went on to become a powerful Memory Wizard of House Anima, and was often consulted by Asalah, recently appointed Head Constable to the Council of Nine. Akane helped her solve countless difficult criminal cases. "Do not fear what you remember. Fear what you might forget." Ammar was born the first son of the Wizard Azimuth, the legendary labyrinth builder whose vaults and mazes are considered marvels of the Seven Cities. Constantly in search of architectural inspiration, Azimuth took his son on expeditions to visit ancient ruins of the Shantiris during the boy&#8217;s childhood. Ammar cared little for the ruins, but he fell in love with the spooky statues scattered within them. The scattered remains of stone Golems and Gargoyles would send his head and dreams spinning. As he grew up he sought every story there was concerning the Shantiri magical Constructs: animated creatures fashioned with stone, starsilver and precious Dragonblood crystals. Ammar went on to study in the new Construct wing of House Materia. Materia had for centuries been the school that brought the Seven Cities architectural wonders and walled protection. They were specialized in building invisible gates and floating arches, impenetrable towers and misty cool amphitheaters that were every bit as wondrous as the plays performed there. Though they did build fortresses, catapults, walls and castles, assuring the Seven Cities&#8217; protection, they were never concerned with the building of their own army. Ammar learned the basics of manipulating stone in architecture, mastering the Elemental Magic of Earth and Water. He would certainly have followed in the footsteps of his father Azimuth had he not been visiting Al-Yaqut the day of the great fire. He witnessed the deaths of several young students at the blistering hands of a ravaging Fire Elemental. He suddenly had a revelation. An army of Constructs was the only reliable guarantee for Seven Cities independence. The Shantiris must have learned this for themselves long ago. Ammar began promoting the idea that the Wizards of the Seven Cities and their four Houses were powerful because of their diversity, and that no one House was superior to the others. He proclaimed each House one of four legs of the same table, one of four pillars of the same tower, and if one were to become bigger than the others all of them would fall. No House should ever be allowed to become completely dominant or the beauty and wonder in the diversity of the Seven Cities would either be burned to the ground or rot in decay. Ammar first set out to convince House Materia to accept its responsibility on the battlefield alongside the other Houses, and then worked diligently to create armies of Golems, Gargoyles and eventually Titans that would stand their ground alongside the army creatures from the other houses. They would have their purpose in maintaining a balance of power, but the Constructs could become the bulwark of the forces of the Seven Cities, guaranteeing its protection. The Orcs and Beastmen created by the Wizards of House Chimera had once revolted, nearly burning the Seven Cities to the ground. The Djinns and Elementals of House Anima required exceptional and often over-ambitious Wizards to summon and control them, while the Skeletons and Zombies, along with their Dark Necromancers, Liches and Vampires of House Eterna were simply&#8230; inhuman. A properly crafted Construct would be loyal until its destruction. It had no choice. It was made that way. Ammar's sound politics and diplomatic temperament eventually lead him to become head of House Materia, and he was invited to become one of the Council of Nine. His future exploits would earn him other titles, notably Lord General of the Construct Armies. "Give me a pile of clay and a Dragonblood Crystal shard and I'll make you a formidable soldier. Give me a mountain and a Dragon Vein and I&#8217;ll fashion an army that can win this war." Hakeem was born in Al-Rubit of the Seven Cities. He had a particular knack with the manipulation of the life forces of animals and magical beasts. He rose slowly and surely through the ranks of House Chimera, the smallest of the four major Houses, and became one of its most powerful Wizards over a long and steady career of spectacular creations and discoveries. Early in his career, Hakeem gained fame and fortune overnight by creating a very popular household pet, the Griffbird. Mixing the bloods and spirits of canaries and alley kittens and exposing them to magical radiations created by Dragonblood Crystals, he offered one of the most beautiful and playful domesticated species of its day. Though the race of creatures was not able to reproduce independently, it could be made in sufficient quantities to create a dozen per month that were each suddenly worth a fortune. Not only could the Griffbird catch mice with amazing agility, it also loved to curl up in its owner's arms, cheeping and purring at the same time. His initial fortune made, Hakeem lent his curiosity to the building of armies and perfecting the troops of Rakshasas and other Beastmen. One day, Hakeem had an epiphany observing a colony of ice ants alongside a small stream. He was intrigued how one would sacrifice it brother&#8217;s body to cross a river by freezing it so that it would become a part of a frozen bridge. Then that very same ant would become the target of the next ant in line that would freeze it. Once the bridge of living icicles made, eventually twigs and other debris would complete the construction, and a few of the ants would actually be thawed out and survive. Most of them would float away in the current over time and either drown or be eaten by fish or birds. How did they know to do this? Hakeem suddenly realized that they were connected through their blood and minds, unable to distinguish their identities totally the one from the other. This revelation would guide him in his research for the rest of his life, and lead him to become the first Crimson Wizard. Hakeem had the idea to mix his own blood and life force with the creatures he created and subsequently mix a little of their blood with his own. His goal was to create a magical link, or bond. It worked beyond his wildest dreams. He first linked himself with a Griffbird, and suddenly with a little concentration, could see himself flying through the streets of Al-Rubit, and then as the bird descended, he could see himself through the creature&#8217;s eyes as it jumped onto his own shoulder. The bond was much stronger than with that of a regular familiar. In fact Hakeem discovered that the Griffbird was part of himself. There were also drawbacks. A few weeks later, when the Griffbird was killed by a pair of eagles on a hunting trip, Hakeem fell immediately unconscious and even after waking he couldn&#8217;t move for a day. But in spite of his numerous setbacks, Hakeem had discovered the secret of the Crimson Bond, and created a new branch of study within House Chimera. Any Wizard from that day forward who linked himself with a creature or Beastman, be it great or small, was called a Crimson Wizard. "If it bleeds it can join you and make you something greater." Myranda was recruited into the Blademage academy at the age of 8 years and a day. She had been spotted juggling thirteen balls to bemused audiences on a street corner in Al-Jamasht. This was a clear demonstration of that rare combination of natural and magical motor reflexes sought by the Blademage recruiters. Her family of street performers were given a hefty compensation in gold to allow her to serve a nobler cause. Myranda held the rank of First Blade at twenty-five and was offered a position within the prestigious order of the Forty Blades the next year. Her life now dedicated to the protection of the High Wizards gathered in the Council of the Nine. Myranda&#8217;s specific assignment was as the personal bodyguard of High Wizard Hakeem, the leader of House Chimera. Another kind of magic for which there is little protection and no remedy, took ahold of both of them. They became passionate lovers. "I do not fear death. I fear rebirth, for every single time I come back as a Demon." Ignatius is an Incubus born in Sheogh as the result of a pact his mother made with Phrias, the Demon Prince of Destruction. After the debacle of the 2nd Eclipse, he and his Demon troops survived by scavenging Magic energy from the Dragon Veins. He enjoys a limited amount of freedom from Phrias after the Demon is corrupted by the Throne of Renewal. He offers to join forces with Ammar and Hakeem who decide to trust him for the duration of the battle. Ignatius senses the tremendous Magic power dormant in the Throne of Renewal and believes he could use it to erase the curse that binds him to the Lords of Chaos, never having to return to Sheogh again. He will get his wish in another way, as after the battle a Rift opens up erasing Phrias, and therefore relieving him of his bonds to Sheogh. He is told by a Blind Brother that when he dies the next time, he will be reincarnated by Asha and not Urgash, to become once again a Man, a Dwarf or perhaps an Elf. It is of little importance because he won&#8217;t have any memories of his precedent life. Ignatius is given an opportunity after the battle to occupy the ruins of the Five Towers with his small army of survivors, provided he does not leave the desert. He decides to remain, though it is tempting to commit suicide to be born once again a creature of Asha and not a Demon. He decides that the Dragons still have a purpose for him as an Incubus, so he remains in that form until fate or age decide to kill him. His curse is gone with the disappearance of Phrias. He becomes a rare Demon hero who lives on the surface of Ashan. "I like the smell of Ashan. Its surface is where I belong." Edited by EnergyZ at 19:21, 20 Dec 2016. Ah, thanks Avonu. Where did you get the descriptions and the characters' titles, though? Also, could there be more? Since I did found Asalah's biography. Asalah was born on a frontier border within a stone�s throw of a garrison of Falcon Crusader Knights. Her childhood was very pleasant; her parents were duty inspectors and earned a quite handsome living. She loved crossing the border to visit the strange Priests and Knights of the Holy Empire, and drank up the stories from the travelling merchants and diplomats who went through her parent�s outpost. Extremely beautiful and gifted with natural charm and charisma, she would pull the air out of a room whenever she entered it. She was a favorite of the travellers who all remembered her name. In her early teens, a tragic event would mark her life. She was raped by two cruel and devious Crusaders who had made a deal with a local Witch living in nearby Shantiri ruins. Using forbidden magic, the witch could turn lies into truth. Torn and bruised, Asalah ran to her parents to announce the disgraceful attack. But when the Crusaders were confronted, they claimed that it was not them, but that it didn�t surprise them one bit what had happened. Asalah had been flirting with all the Knights and Squires of the garrison, and certainly must have had too much drink and one too many flirtations. The Crusaders� testimony was supported by the Priests of Elrath who had used the magic of the Light to test their innocence. The Witch could not be found, but the Crusaders were delivered for execution to the Sheriff. Asalah was permitted to cast the first stone and make the first cut on each of their bodies. She chose to slice off their manhood. All was not easily forgotten nor healed by Asalah, and she bore a son from the forced union that she raised alone with her mother as if he had been brought into this world through love. She named him after her father who had died protecting her honor. When the child was seven and she barely twenty-one, she requested to follow training to become herself a hunter of criminals and practitioners of Forbidden magic. The Sheriff who had helped her agreed to sponsor her training and education. She proved relentless and piercing in her quest to protect those of the Seven Cities from injustice and false accusation. I am just looking for official descriptions of those abilities. These are: Combat Guard, Perfect Retaliation, Stackable, Armor # and /Element/ Aligned. Maybe they appeared in a certain form, but were not mentioned. Here's one version and here's the older version of the same card. Perfect Reta: Unit always retaliates to everyone, if it survives the attack. Meaning even to shooters and such. Armor x is like a permanent Combat Guard. Edited by RMZ1989 at 10:09, 23 Dec 2016. Ah DoC... brings back memories, probably the best online card game that I had played. Too bad that Ubi's incompetence completely butchered the game. Nonetheless, it was a great ride. EDIT: Btw, hi guys, I haven't posted for a long time but I am still lurking around. Edited by EnergyZ at 19:57, 25 Dec 2016. I agree. I haven't played it that much, but the quality was much better. And, uh, since it is Christmas, it is appropriate enough to share these pictures. There also are for Halloween, too. Well, I have just finished adding all the images. Took some time. From looks of things, the only thing required is to add the card sets and decks. Creating sets isn't tough, but where can I find info about them decks? meta deck was some variation of massrage-spam, and there was a deck that abused the bugged area blast and the spell giving same. I was referring to pre-built ones, that could've been bought from the shop. Edited by Avonu at 18:29, 30 Dec 2016. Here you have in Polish (move mouse cursor over "Lista kart w pakiecie"). Edited by EnergyZ at 20:49, 01 Jan 2017. Pretty certain there are others among them. Not certain if the translation is "/faction/ expert deck" or whatever. Translating words was quite difficult, and here are the ones I don't know about. These are translated from Polish to English through Google. I'd really appreciate if someone could translate them properly. And, on a side note, does anyone know who Nahla is? Edited by Avonu at 14:44, 02 Jan 2017. Can you just take a screenshot of the list and underline names which you don't know? Google translator is not helping and some many of cards have different names in Polsih then in English. Hakeem might have founded the Crimson Wizards, but Nahla is quite possibly their best adept. With Fire and Prime magic and some fearful beastmens, she'll have no trouble taming her enemies. Welcome to my laboratory! I am Nahla, Alchemist of Al-Imral. Can I help you? Al-Imral is House Anima (summoners) city, one of few which survived War of the Broken Staff. However, Crimson Wizards originated from Al-Rubit before they moved to Karthal. Edited by EnergyZ at 16:09, 02 Jan 2017. Well, might be better if I just write it out. Great! That was very helpful. But things aren't over yet. I also noticed things like these. Obviously there are more decks from Sins of Betrayal and Heart of Nightmares, if I recall. But this is where I don't know of any sources. Also, there are the decks, as seen on this picture.